The market was constructed in the 1660s as part of the New Mosque, with rent from the shops supporting the upkeep of the mosque as well as its charitable activities, which included a school, hamam and hospital. The market's Turkish name, the Mısır Çarşısı (Egyptian Market), references the fact that the building was initially endowed with taxes levied on goods imported from Egypt. In its heyday, the bazaar was the last stop for the camel caravans that travelled the Silk Road from China, India and Persia. 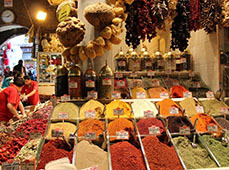 Vividly coloured spices are displayed alongside jewel-like lokum (Turkish delight) at this Ottoman-Era marketplace, providing eye candy for the thousands of tourists and locals who make their way here every day. Stalls also sell caviar, dried herbs, honey, nuts and dried fruits. The number of stalls selling tourist trinkets increases annually, yet this remains a great place to stock up on edible souvenirs, share a few jokes with vendors and marvel at the well-preserved building.